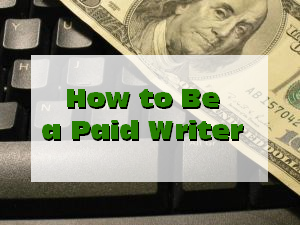 In the first lesson of the How to Be a Paid Writer series, you learned why it’s essential that you take the time to polish your writing skills before you venture into the world of paid writing. In lesson 2, you’ll learn how to set realistic expectations for your freelance writing business and earnings. First, keep in mind that every writer has an opinion based on his own experiences. However, if a suggestion related to how much you’ll be able to make as a freelance writer seems too good to be true — it probably is. The amount of money you can make as a freelance writer depends on a wide variety of factors, some of which are discussed below. If you’ve been writing formally in some way (I’m not talking about writing for yourself or for fun) that can be quantified, then that experience can help you build your career as a paid writer. For example, if you write reports or communications for your current employer or if you’ve written articles for your local paper, those efforts can help you develop your paid writing career. Not only have you gained experience writing for other people and meeting their expectations, but you also have some clips and references to add to your writer’s arsenal, which you can use when applying for paid writing opportunities. Be realistic though. Those clips and references might not be as compelling as those provided by more seasoned writers applying to the same job as you. Therefore, keep plugging away and building your arsenal, so you have enough evidence one day to prove exactly why you’re the person to be hired for the jobs to which you apply. Believe it or not, your non-writing experience can help you land paid writing jobs. For example, if you can write well and have a professional background in a specific area that a client is looking for, you could be a more desirable candidate than one who has a lot of writing experience but no experience in the specific area that the client is looking for. An example could be a website looking for someone to write about nursing. A seasoned writer with no medical experience is likely to be less desirable than a nurse with no writing experience but the ability to write some samples that are great. Freelance writers have to start somewhere. That means you need to devote time to building your portfolio and clips. You might have to write for websites or clients that are not your dream partners. Only you can decide which specific writing opportunities are right in terms of helping you meet your long-term goals, but without writing samples of some kind, you can’t expect to pick up many higher-paying writing jobs. There is a lot of competition in the freelance writing world these days. With the growth of the social web and the hyper-connectivity of people around the world, the pool of available writers has grown exponentially. Furthermore, writers around the world are willing to work for very different rates. Unless you can prove to a potential client why you’re worth more money, it can be difficult to land some writing jobs. Furthermore, the publishing world has changed significantly. There are fewer print publications seeking fewer freelance writers these days. In fact, many print publications (and online publications) are able to find plenty of writers who want to write for those publications for free in exchange for the exposure those publications can bring them. That means publications can fill their content quotas with free content from authoritative writers. Freelance writers have to look in new places to find work, and they need to market themselves in new ways in order to find more work. For example, a decade ago, an online presence for a freelance writer wasn’t critical. Today, freelance writers are beginning to realize the power of the social web in terms of boosting Google rankings, networking, brand building, and more. The social web has become an incredible marketing opportunity that can help any freelance writer build a business as a paid writer. If you’ve been reading the Building Your Freelance Writing Brand series here on Freelance Writing Jobs, then you know that two of the key components of building a successful brand are patience and persistence. The same factors apply to building your career as a paid writer. Success is unlikely to happen overnight. Instead, you need to be prepared to work toward the long-term and keep trying again and again. In time, your patience and persistence will pay off. Yes, luck can help you build your career as a paid writer. Truly, sometimes being in the right place at the right time can catapult a struggling freelance writer’s career into a new stratosphere. If another writer’s story of their earnings and success amazes you, consider the source. There might be some luck in there which gave them an added boost that they’re omitting from their story. Bottom-line, you need to set realistic expectations for your freelance writing career. It takes time and effort to grow a freelance writing business in a world that’s creating fewer opportunities and lowering rates more each day. Stay tuned for Lesson 3 of the How to Be a Paid Writer series where you’ll learn about choosing your niche and the value of focus!